DAY 2 — Transfer to the airport and fly back to Addis. 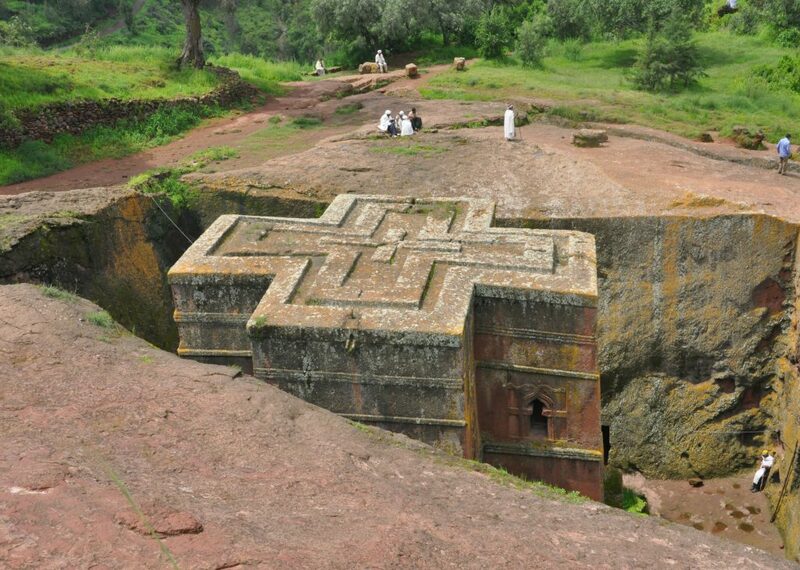 DAY 1 — Transfer to the airport and fly to Lalibela. Visit the rock hewn churches of the 12th century and the fascinating monolithic carvings. The site is well known as one of the wonders of the world. Overnight Hotel. DAY 2 — Fly to Gondar. On arrival the guide will drive you to the hotel. Then after you will be taken to the Castles built by various Kings during the time of the medieval period and the ancient churches with their unique frescos. Overnight Hotel. DAY 3 — Drive to the Semien Mountains National Park, one of the most beautiful stretches of unspoiled wilderness surviving in the world today. Overnight stay Semien Lodge. DAY 4 — The Semien Mountains and the strange and fascinating world surrounding them have not one grand canyon but up to 100 gorges so deep and steep that it may take as long as two days to trek them. Full day trek to the jagged peaks of the distant mountains. Overnight Semien Lodge. DAY 5 — Morning trek to adjacent peaks to see Walia Ibex, endemic to Ethiopia, and Gelada Baboons. After lunch drive back to Gondar and overnight Hotel. DAY 6 — fly back to Addis Ababa. Day 9 — Fly Back to Addis After breakfast drive to Dire Dawa where you will have a short stay then transfer to the airport and fly to Addis Ababa. En route we stop at the town of Awaday to see the biggest Chat market in the country. ‚Chat is a stimulant leaf that people chew to be relaxed. Upon arrival to Addis, the rest of the day will be for shopping: in the evening a fare well dinner party in one of the traditional Ethiopian Restaurants with dancing from the different ethnic groups. Then transfer to the airport for Departure. Day 7 — Fly to Addis Ababa. Overnight Hotel. Day 2 — Addis Ababa – Debre Markos, after breakfast drive to Debre Markos via Dejen (the famous area for growing teff, which is a staple food of Ethiopians), after 103 kms drive, visit the 13th C monastery of Debre Libanos and the 17th C Portuguese Bridge. En route have stop over to visit the Oromo tribal village. Further down, you will enjoy the fabulous Blue Nile Gorge. Similar to the Grand Canon of USA. Overnight Hotel. Day 3 — Debre Markos - Bahir Dar Drive about 250kms to Bahar Dar (Bahar Dar is a modern town on the shore of Lake Tana,) through the beautiful scenery and visiting the Amhara people & their villages. Have a lunch at Bahir Dar, the capital of the Amhara National Regional State. Afternoon, we take a city tour of Bahir Dar that includes: Colorful market of pottery, traditional hand-made woven clothes, etc. The Woito basket market and Mount Bezawit where the palace of Emperor Haile Selassie is gracefully situated. This hilltop is the best viewing point for the town, the lake and the river. Overnight Hotel. Day 4 — Bahir Dar, After breakfast drive to the small town of Tiss Abay to visit to the impressive Blue Nile Falls, locally known as Tis Isat or 'Smoke of Fire'. The falls throws up a continuous spray of water droplets which drench onlookers up to a kilometre away. Much of the water is diverted to for hydroelectric generation but it is worth visiting for the walk around and see the rural life. The area around the river is extremely fertile and the Amhara people who live here farm wheat, sorghum and teff (from which injera, the national bread, is made.) After the Falls, return to Bahir Dar for lunch. The rest of the afternoon visit the local market of the town where local people from the country side and the people from the town gather for selling and buying the produce. Overnight Hotel. Day 10 — Mekele – Lalibela. On this day, you will have the longest drive through the rough roads and will experience magnificent scenery). You will have a chance to visit Lake Ashenge and which is good for birding. Proceed to Lalibela for dinner and overnight Hotel. Day 12 — Lalibela – Kombolcha. After breakfast drive through the highland area of Delb where you can see the endemic Gelada baboon. Have stopover at Hayk to visit the 13th C. monastery of Hike Istifanos on the island of Lake Hike. Proceed to Dessie for dinner and overnight Hotel.